When ordinary, decent people are made aware of Charles Byrne and his predicament their sense of Justice is offended. Because of his physical difference, Charles Byrne – The Irish Giant, has been condemned to be displayed in a glass case ad infinitum, somewhere within the hallowed halls of the Royal College of Surgeons in London. Charles Byrne’s skeleton has been standing among freakish exhibits such as two-headed goats and syphilitic penises in formaldehyde for more than two hundred years. So, if you ever visit London you should certainly visit The Hunterian Museum. Admission is free. Unlike Charles Byrne who remains incarcerated in his glass coffin. Legend has it that if you put your ear up to the glass case in which Charles Byrne, the Irish Giant is interned you can hear him whisper these three words - “ Let me go”. And we, ordinary, decent people agree. It’s time to let him go. 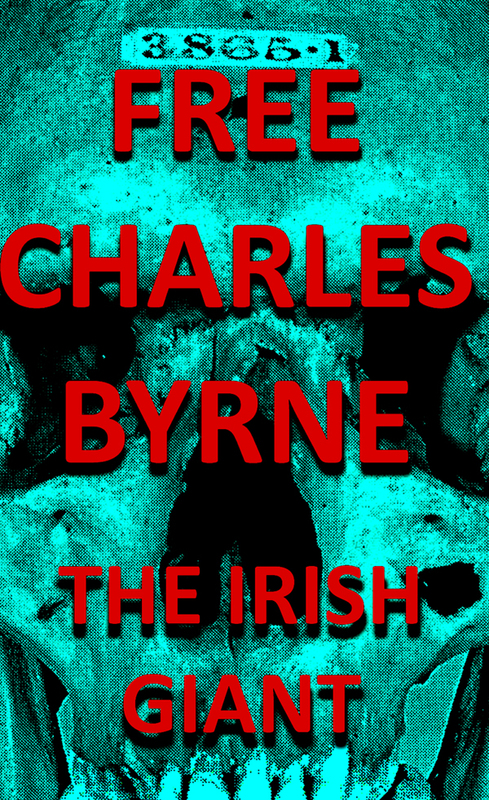 The campaign to free Charles Byrne needs your help. to let him know that you object to Charles Byrne’s bones being on display and think that his remains should be returned to Ireland for burial. You may wish to CLIP the template below for inclusion in your email. I would like to draw your attention to an injustice being perpetrated on an Irish citizen. Because of his physical difference, Charles Byrne’s remains have been on public display at The Hunterian Museum, The Royal College of Surgeons, London for more than two hundred and thirty years. This indignity is a direct contravention of Byrne’s documented dying wish to be buried at sea. We demand that Charles Byrne’s body be immediately removed from public display and returned to the Irish state to be given a dignified and long overdue burial at sea. It’s time to let him go. Here is a PDF of the standard reply the Hunterians will send you. You could attach this to your email to The Hunterian Museum with the request 'Please do not send me this letter'.